Driving north on US-93, just south of Jackpot, Nevada, we were about to cross from the Great Basin onto Idaho's Snake River Plain when we pulled into a roadside turnout. Stretching stiff legs, I turned around to see a devil of a storm approaching from the south. Whoa! A wall of gray roiled up into a towering cumulus sky, while tendrils of rain spiked down towards black mountains. In the space of a few minutes, the air grew dark and the wind started to howl, blowing toward us an amazingly strong scent of sage, damp earth, and ozone ahead of the approaching rain. 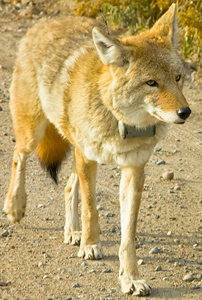 As dust clouds rose, two packs of coyotes on either side of the highway started to yip and yell to each other as if to assert themselves against the forces of nature. A flash of lightning and crack of thunder sent us running back to the car as quarter-sized raindrops pelted our heads. 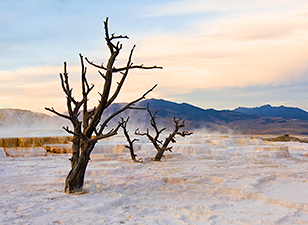 The magic of the road and of the West's wide open spaces cast its spell on us. 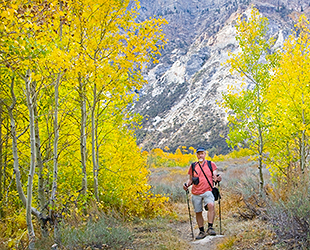 Autumn is our favorite time to hike and explore the remote places of the western states, and this feels like an auspicious start to what is expected to be a couple-month ramble. Adventure yes, but hopefully a little less than last year's trip -- no helicopter rides! 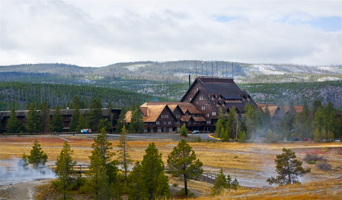 We arrived at Yellowstone's northwest entrance on a day with scattered thunderclouds and brilliant sunshowers. In the first few minutes driving along the Madison RIver we saw soaring bald eagles and herds of elk and deer. It was such a surprise to see how tame the wildlife is here, totally used to seeing 3 million of us ply trails and roads each year. It's a little bit like an animal theme park, but amazing to watch them do their animal thing, completely ignoring our presence. A lone wolf howls in the night, sending shivers of excitement down our spines. 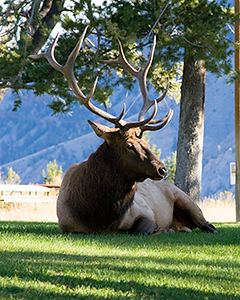 We're camped at Slough Creek, at the edge of Yellowstone's Lamar Valley, anticipating the dawn when we hope to glimpse one of these elusive creatures. 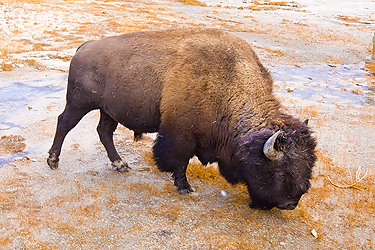 Banished from Yellowstone Park in the 1920's (every last one was shot), then re-introduced in 1992, their numbers have slowly increased to several thousand, with thirteen separate packs roaming freely through the park's vast, sweeping meadows. Earlier in the evening we met Larry, the self-proclaimed: "Best Yellowstone wolf photographer there is," who is camping here for a full month, capturing photos with his enormous 500mm lens (approximately 2 feet long, it weighs over 5 pounds, not counting the enormous tripod he slings over his shoulder to steady it.) Larry sells his photos to Defenders of Wildlife, National Geographic and others, supplementing his modest retirement income as a former high school biology teacher. (Hmmmm, not a bad idea, we think....) In the cluster of tents next to the creek just below us, scope-toting wolfers who have joined a Yellowstone Institute class are praying they realize long-held dreams. We drive out of the campground just as the sky is lightening and there they are: fifty or more wolf-watchers lined up along the ridge top, their scopes and lenses tracking a lone black wolf far across the rolling meadow, barely visible in the high golden grass. Everyone is chattering excitedly, laughing and happy to share this magic moment with us. I sidle up to one of the scopes, and there he is -- a teensy black speck, loping through the grass, only visible with a powerful scope! Next morning we set out again from the campground, driving slowly as we wound along the rutted dirt road. 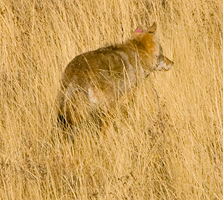 Rounding a bend we came upon an incredible sight: a solitary wolf is running down the road, straight towards us! He stopped suddenly, and began staring intently up into the forest. He never moved a muscle, never blinked an eye, even though we were no more than 20 yards from him. We stopped the engine and stared at him, as he stared up the hill. After several minutes of intensely searching the hillside with our tiny binoculars, we finally saw his prey -- a magnificent buck with an broad rack of antlers. The buck stood frozen, staring unblinking at his predator below. Minutes went by, the standoff continued. We didn't move, the wolf didn't move, the buck didn't move. Finally, the wolf inched forward, barely moving one paw and the action began. 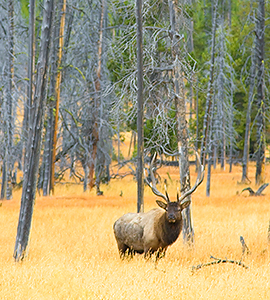 The buck spun around and leapt deep into the forest, fleeing as our wolf sped up the hill after him. When the two of them disappeared in the dark underbrush, we finally caught our breaths. We wondered whether our wolf really was alone. 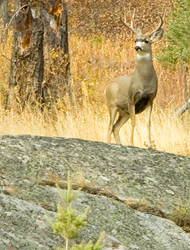 Were other members of his pack also stalking the buck, just out of our sight? 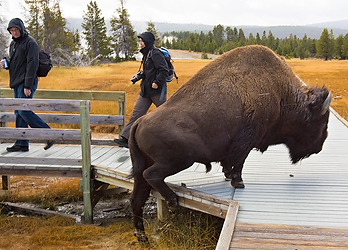 We felt incredibly lucky to have happened upon this incredible encounter! 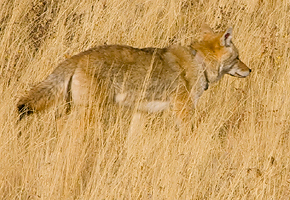 Our wolf was small and we debated whether he was, in fact, a coyote. Later that day, we described what we had seen to a helpful ranger, and determined that he really was a wolf. Only the wolves are radio-collared, as this one was. The radio collar was huge and cumbersome. His was mounted on a wide, tightly cinched leather band, with a big box transmitter and a 6-inch antenna sticking up in the air. Surely he would be at a disadvantage in any fight -- fights between wolf packs cause most of the most wolf deaths in Yellowstone. 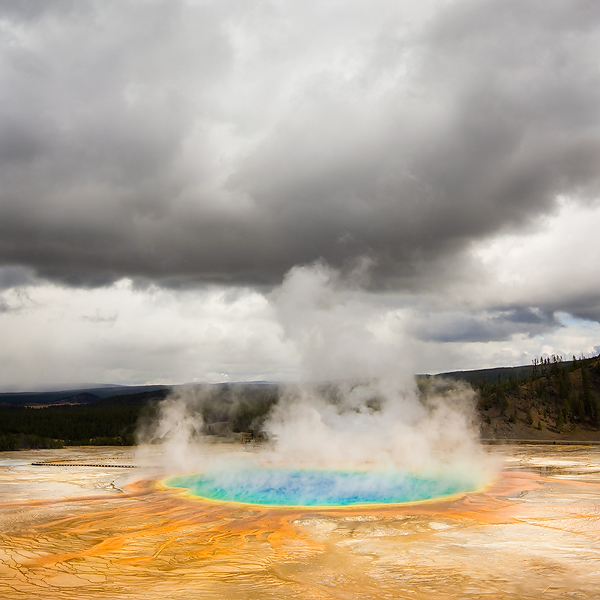 One of the coolest things about Yellowstone is all the geysers, steam vents, and hot springs. 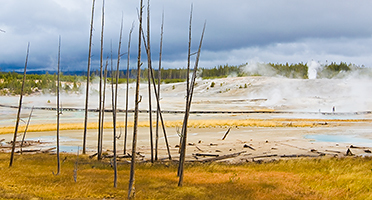 About half of the world's thousand or so geysers are here in the park. 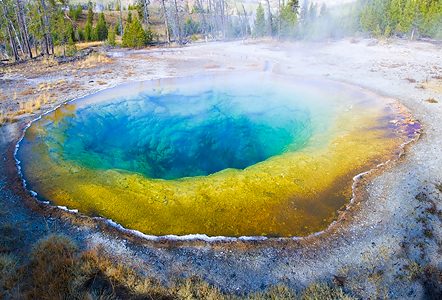 Like a living thermometer, the amazing colors are due to the presence of bacteria. Each different colored species lives only in its preferred temperature zone. 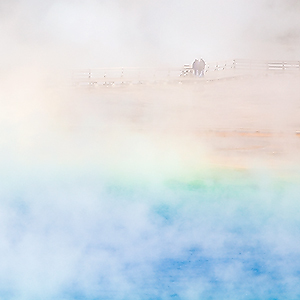 Like a vision from another planet, steam rises from the Grand Prismatic Spring to meet the clouds. Images ©2008 Mark Goudy and Liza Riddle. All rights reserved worldwide.